With the People from the Bridge by Dimitris Lyacos. Shoestring Press, 2010. 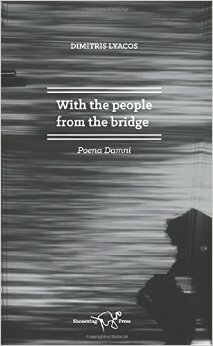 With the People from the Bridge constitutes part two of the Poena Damni series by Greek poet Dimitris Lyacos. In part one, the world has undergone the apocalypse, or at least the beginnings of one. Three around a cut-down oil drum, another one fetching newspapers. They tore some up and threw them inside. Fire. It went out. Again. A scar like a word on his chest, from his neck downwards. Sits down, takes two piece of wood, hammers, he made a cross. Sticks it in the mud. To the side a glass and a bottle. Then it started to hurt me. Listen. He is coming up the stairs. Don’t stand up. He is coming. He came up. He has come. They put her inside, face down. Inside there was someone else too. They dropped her on top of him. They put the lid back, forced it to close. Maybe the predicament of the people on the bridge is the result of their clinging to a trinity that does not concern itself with love or beauty, a trinity made up of the Narrator, LG, and NCTV. Like the Christian deity, these three ghostly persons are not sharply distinguishable, being a single entity. Maybe the people on the bridge are in some kind of war — a war they are losing, Maybe they represent the transition from an abyss to….we aren’t told. When the Narrator writes, “I couldn’t understand / Then one by one. I still couldn’t understand,” we know he is confessing the unconfessable. Someone has to understand. He should understand. The partially decomposed head of a woman, stolen from a crypt at Hollywood Memorial Park Cemetery early Sunday, was found in the street next up to a man who was subsequently arrested, Los Angeles police said. Shorsha Sullivan has done yeoman’s work translating this weighty and saturnine piece, keeping the anxiety high throughout. We would love to see him handle something less relentlessly grim.